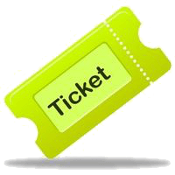 Skip-the-line Tickets can be bought online in advance to avoid queuing. This advance tickets are not for sale for the same day. Note: Admission tickets can also be purchased on site. Note: There is no guided tour possible without appointment. Museums, Castles and Attractions in the area. 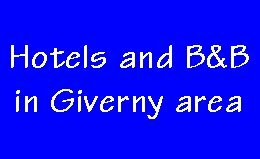 for your next Stay in Paris ! 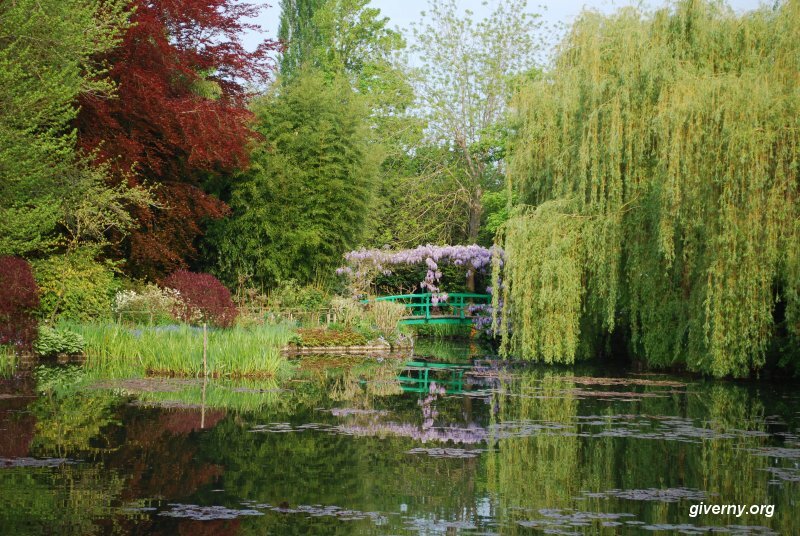 There are two parts in Monet's garden: a flower garden called Clos Normand in front of the house and a Japanese inspired water garden on the other side of the road. 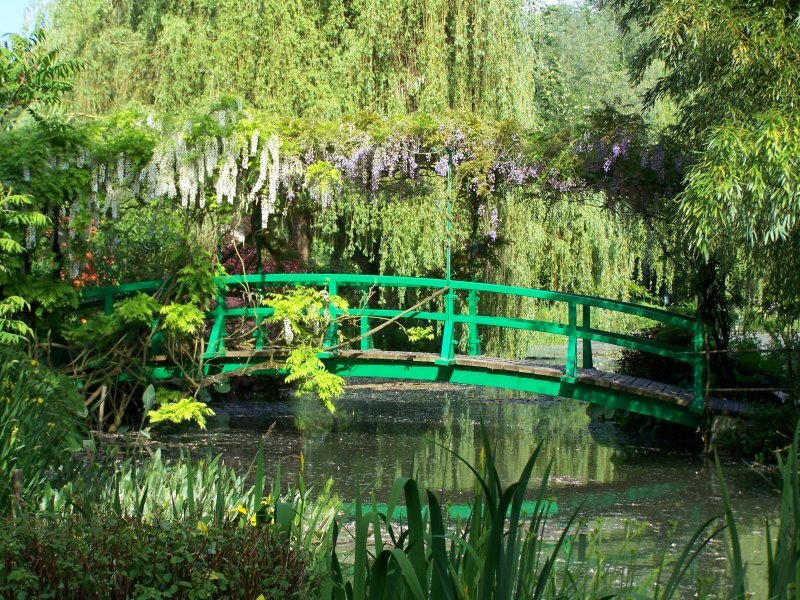 The two parts of Monet's garden contrast and complement one another. When Monet and his family settled in Giverny in 1883 the piece of land sloping gently down from the house to the road was planted with an orchard and enclosed by high stone walls. A central alley bordered with pines separated it into two parts. Monet had the pines cut down, keeping only the two yews closest to the house to please Alice. The land is divided into flowerbeds where flower clumps of different heights create volume. Fruit trees or ornamental trees dominate the climbing roses, the long -stemmed hollyhocks and the coloured banks of annuals. Monet mixed the simplest flowers (daisies and poppies) with the most rare varieties. The central alley is covered over by iron arches on which climbing roses grow. Other rose trees cover the balustrade along the house. At the end of the summer nasturtiums invade the soil in the central alley. 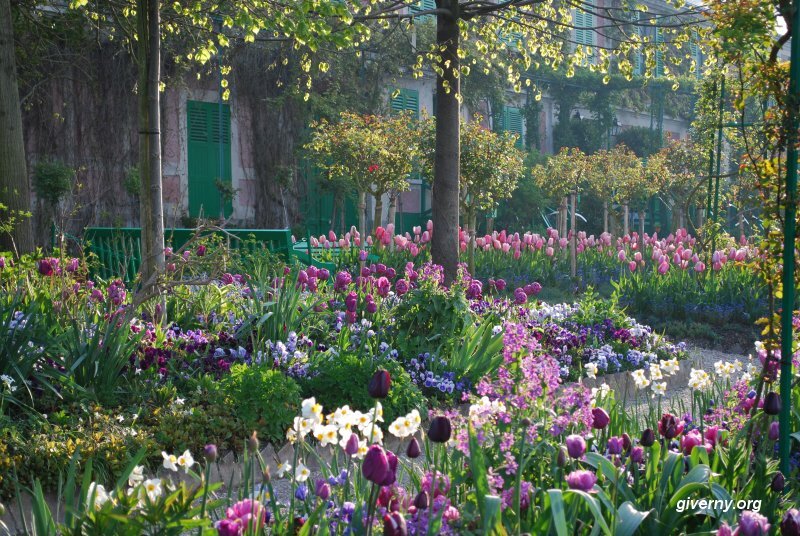 Claude Monet did not like organized nor constrained gardens. He married flowers according to their colours and left them to grow rather freely. With the passing years he developed a passion for botany, exchanging plants with his friends Clemenceau and Caillebotte. Always on the look-out for rare varieties, he bought young plants at great expense. "All my money goes into my garden," he said. But also: "I am in raptures." In 1893, ten years after his arrival at Giverny, Monet bought the piece of land neighbouring his property on the other side of the railway. It was crossed by a small brook, the Ru, which is a diversion of the Epte, a tributary of the Seine River. 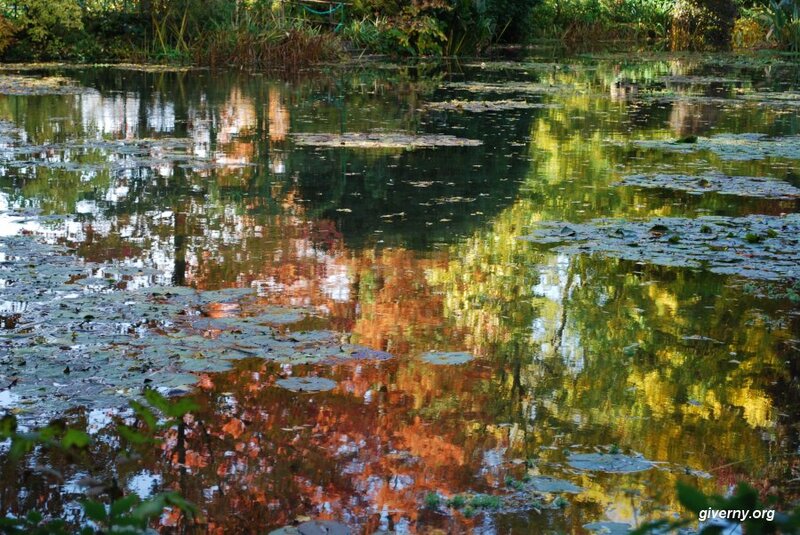 With the support of the prefecture, Monet had the first small pond dug ; even though his peasant neighbours were opposed. They were afraid that his strange plants would poison the water. The wisterias have been planted by Monet. 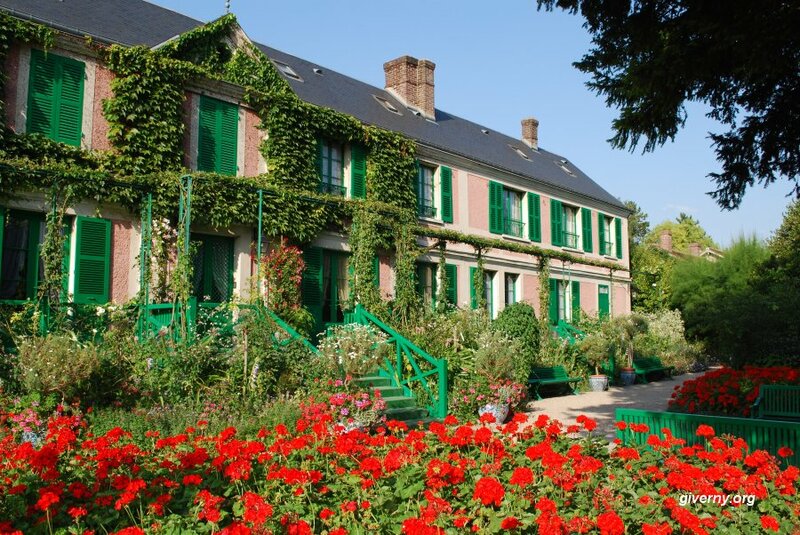 500 000 visitors discover Monet's gardens each year during the seven months that it is open. To prevent people from treading on the plants, and thus retain the garden's beauty, the inner alleys are closed to the public. Visitors walk on the side alleys and can walk all around the garden to admire all its perspectives. To get to the water garden you go through an underground passage (at the time of Monet it was necessary to cross the railway and the road). 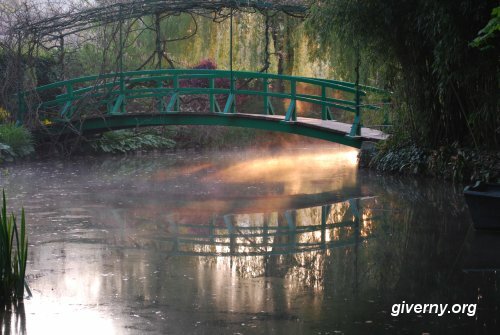 You will step on the Japanese bridge and explore all the hidden recesses of the water garden. Taking pictures is permitted in the garden, but only from the walkways. Picnics are forbidden. Dogs and other pets are not admitted. 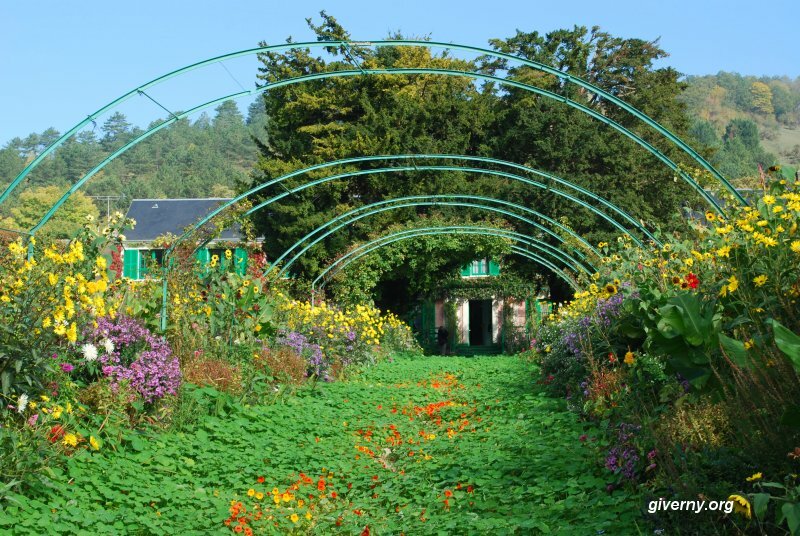 After Claude Monet's death in 1926, his son Michel inherited the house and garden of Giverny. 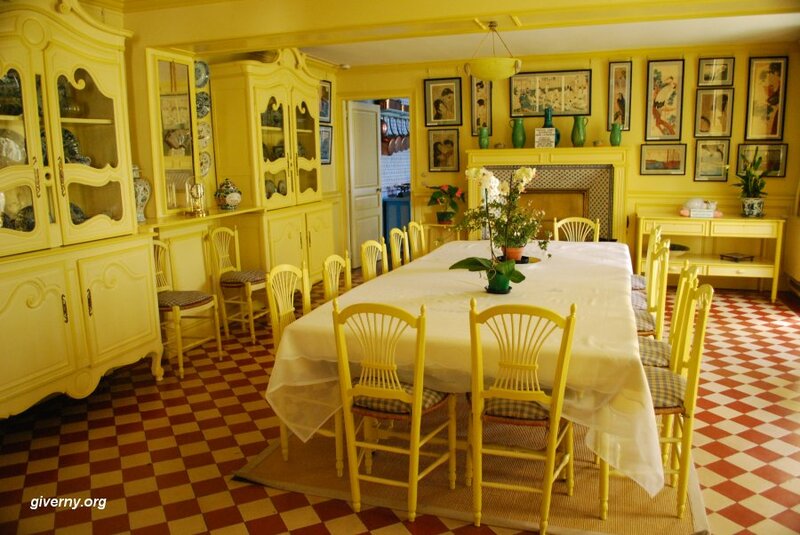 He did not live there and it was Monet's step-daughter Blanche who took care of the property. Unfortunately after the Second World War the house and garden were neglected. In 1966 Michel Monet made the Academie des Beaux-Arts his heir. In 1977 Gérald van der Kemp was appointed Curator at Giverny. André Devillers, who had the opportunity to go with Georges Truffaut - a distinguished gardener often invited to Monet's table - helped him reconstruct the garden as it was by the time of the master. Many contemporaries of Monet testified also. Almost ten years were necessary to restore the garden and the house their former magnificence. Not much was left. The greenhouse panes and the windows in the house were reduced to shards after the bombings. Floors and ceiling beams had rotted away, a staircase had collapsed. Three trees were even growing in the big studio. The pond had to be dug again. In the Clos normand soil was removed to find the original ground level. 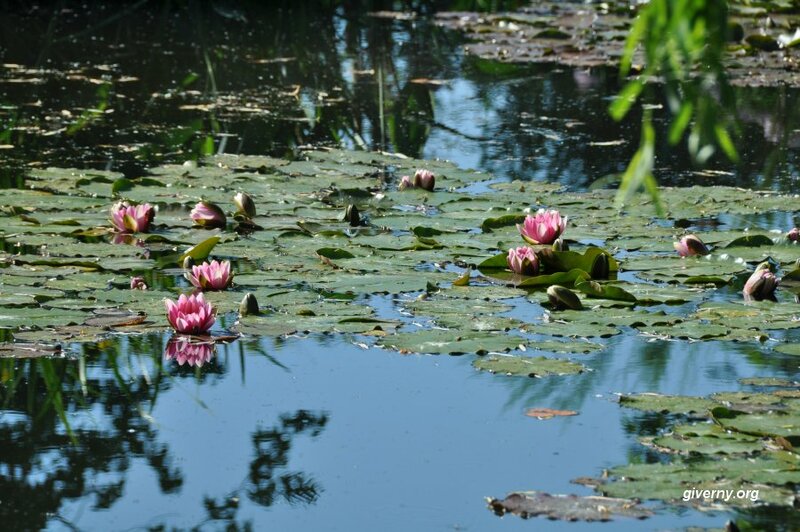 Then the same flower species as those discovered by Monet in his time were planted. Thanks to generous donors, mostly from the USA ,the house was given a facelift. The ancient furniture and the Japanese prints were restored. Then the visitor areas were fitted out. The property has been open to the public since September 1980.